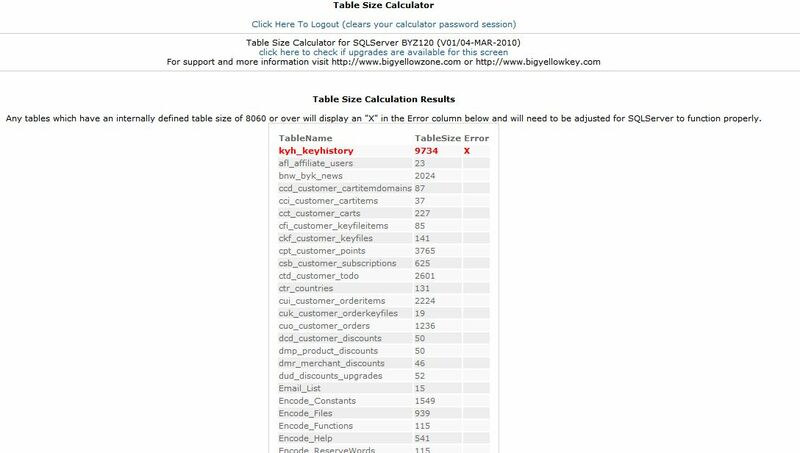 SQLServer (and ADO generally) runs into problems if the definition of your tables (excluding "long" columns like text/ntext fields etc) is above 8k. This handy generic ASP software will allow you to see the size of all your tables in one go, and it'll highlight any tables which are above 8k in bold/red at the top of the list. The calculator screen is password protected, so only you can run it. Very quick and easy to install - just edit the configuration file in notepad to set your options, upload the files to your site/server, open the url on your browser, enter the pwd you configured, and press the go button to calculate/display all your table sizes. 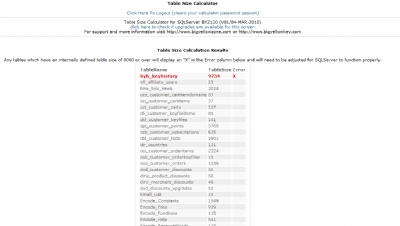 Size calculation relates to the size that your table's definition takes up, this software does not show you the actual space that all your data is using. It's to be used purely to check to see how close your tables are to the 8k definition limit. 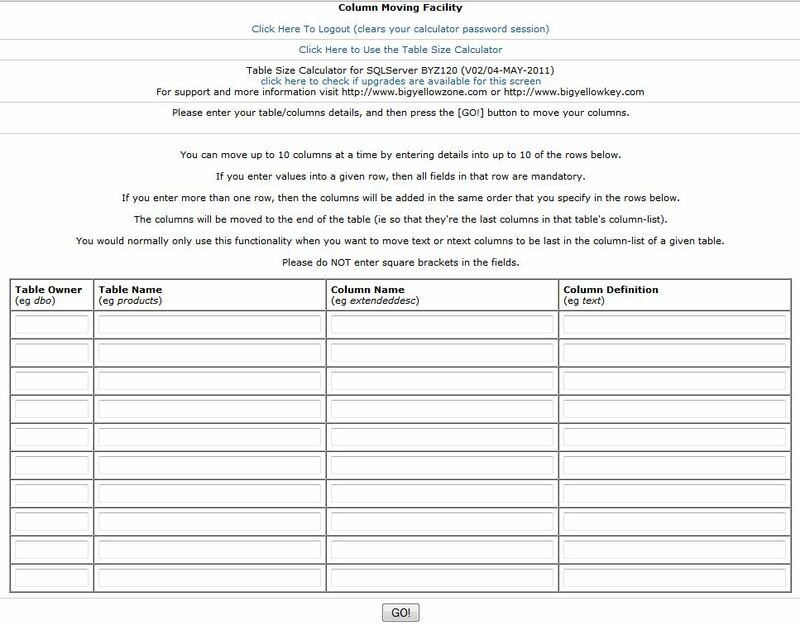 ie This is to show you the record/row size that your table takes up. Another problem that often causes cursors to "blank out" (in a similar way to the 8k problem) is when your text/ntext columns are not last in the column-list on a given table. This module has a built-in "Move Columns" function/screen which allows you to specify columns that you want to move to the end of the column-list in a given table (which is not usually possible to do via sqlserver management studio or sqlserver enterprise manager due to permissions etc), and you can then press a button to move all those text/ntext columns to be last in the list automatically. This function is very useful, because if you've created a varchar column and your text/ntext columns are no longer last in the list, then all you need to do is run this screen, enter the table owner, table name, column name, column definitions of the columns you want to move back to the end of the table again and then press a button; it'll keep all your existing data and doesn't involve dropping/recreating the table. (The installation instructions for this module explain this in more detail). 02 04-MAY-2011 Added extra functionality to allow you to move columns to the end of table column lists (usually relevant only to text/ntext columns). 03 22-JUL-2011 Changed the move-columns logic so that it uses the DBCC CLEANTABLE command after moving columns so that the space used via the creation/dropping of the columns is freed up after the column move process.